Trusted Reviews has tested a multifunction color printer from Xerox. 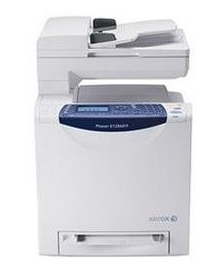 The printer is called Xerox Phaser 6128MFP and is able to print, scan, copy and fax in color. Trusted Reviews ends up giving the Xerox Phaser 6128MFP an overall score of 7 out of 10 points. The MFP printer scores highest on features and print quality, a bit lower on value and lowest on print speed. The 6128MFP is able to make good prints, but there are shortcomings that should be better when you look on the price tag. The shortcomings are slow print speeds, low paper capacity and no automatic duplexing. Read the full review of the Xerox Phaser 6128MFP multifunction color laser printer here.